I started growing veges while recovering from a back injury. I was limited to the amount of work I could handle with a spade, fork, rake because I’d be laid up for days with pain. Only when Eliot Colemans classic book “The New Organic Grower” was recommended to me, I found a tool that let me think of growing more than 10 square meters. It only took fifteen minutes with a Broadfork in my hands to start dreaming of growing better veges full-time! My original Broadfork, 10 years old and going strong! – So, what you get with these tools is five (or seven) super strong tines that can penetrate eleven inches! 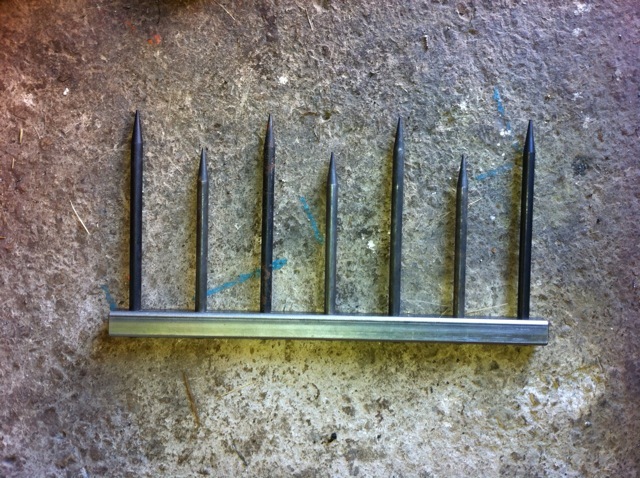 – Tines mounted on a footbar designed to use body-weight and gravity to get the fork all-the-way-in! And uses leverage to do all the hard work! 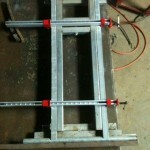 – Sturdy uprights and a cross-bar handle that suits the natural arc of the tool in your hand to keep you working longer. 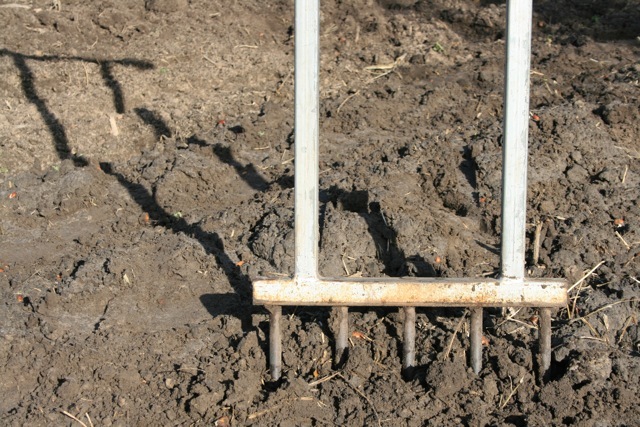 – The tines are staggered lengths so that if they hit clay, they wont bring up too much, or get ‘bogged’ – the stagger really helps fracture the soil as you make each pull. – It’s a tool that can aerate, and break up compacted layers of soil, while working a surprisingly large volume of soil at each ‘bite’. It will heal over-tilled soils in time. But you already have a traditional ‘garden-fork’ -what’s so bad with it? 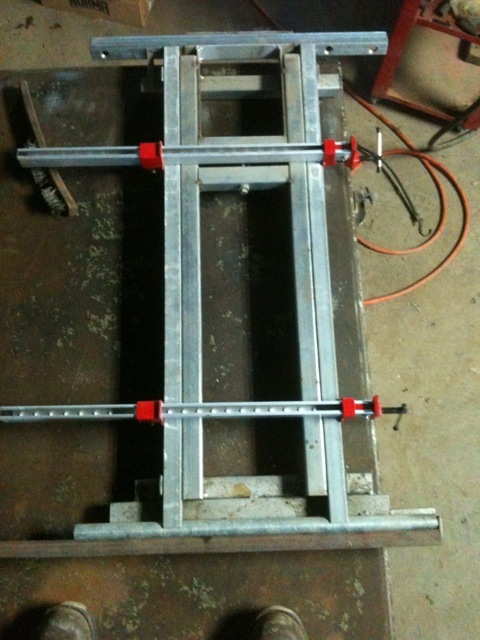 – It wont work as much dirt as deeply, and only works a third the width. – It relies on your shoulders, hands and back to be in dangerous positions when being used for long periods. Every cubic centimeter of soil must be lifted by the poor user! 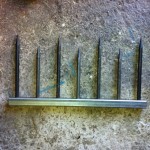 – Cheap steel tines will bend if you catch any kind of root, or stone. 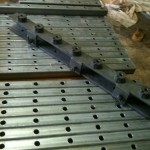 – Well over half the weight of a broadfork (5-tine) anyway! What good is that? Believe me! It will save you sweat! I got mine from Gundaroo Tiller, a small-farm tools outfit near Canberra. And through talking to Joyce Wilkie, the finer benefits started to appear, and my crops were responding great too! She pointed out that a Broadforks action wont invert, or turn-over soil as the “double-digging” methods that we were sold. Which means all our expensive and thoughtful fertilizing wont get buried deeply, where young roots cant get at it, where it would be highly diluted anyway. And when she pointed out that through aeration, Oxygen and Carbon Dioxide are major building blocks of every plant (O, C, H, Si have been said to make up nearly 98% of the physical plant structure! ), And water infiltration is a major consideration to annual vege crops, I had a real hard time to do anything but listen to experience! And still the broadfork was up to the task! Serious thanks to Mike and Joyce for their friendships, minds and hearts – and teaching me to use mine! A year or two later, with permission, I started building my first broadforks after the Gundaroo Tiller pattern, to help bring this tool to South Australia. I now build tools for all kinds of folk, elderly, school-kids, community gardens, professional market gardeners, weekend warriors, and all use it just fine. I really get a kick out of sending these tools off, saving people work (and pain) so they can enjoy the fruits of their labours all the more! 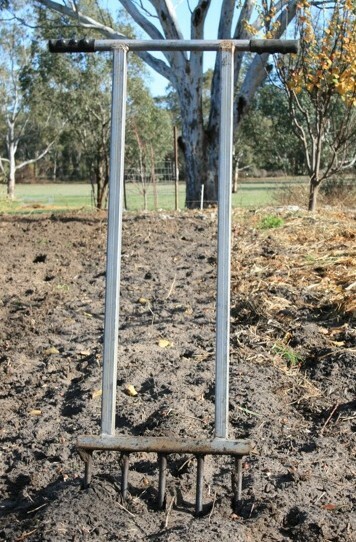 GUNDAROO TILLER – Tools for Serious Gardeners, growing our next growers too! 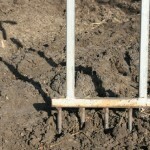 This entry was posted in In the Toolshed!, Uncategorized and tagged aerate, biodynamic, broadforks, ergonomic, fork, organic, soil preparation, spade, tools by humble house. Bookmark the permalink. Please let me know when the broadforks are available. I hadn’t logged in a while now, because I didn’t have much to sell! Broadforks will be back on in (**approx**) a fortnight. I’ll update the main blog to say so! I’ve had one of your broadforks for about 5 years now- it’s like having a whole mob of trained wombats digging for you! 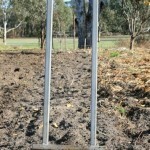 I can turn a 2mx6m bed in about 15 minutes, deeper than I could with a rotary hoe. Go over it again, at a perpendicular angle, and it’s broken up even better. Then a bit of hoeing and a rake, and I’m ready for spring. I also use it before rotary hoeing, as it breaks up the ground deeper than the RH goes, and greatly speeds up the process. Also great for getting manures and other supplements down further into the root zone that otherwise possible, other than by double digging. Do you make broad forks with curved tines similar to the original grelinette design? Wow, it’s been too long! But I’m here now! But no, the curved tines make for hard work in any soil with the occasional rock. if You drive a grelinette into dirt with stone, and hit one, the handles will pull violently forward because of the tine offset. 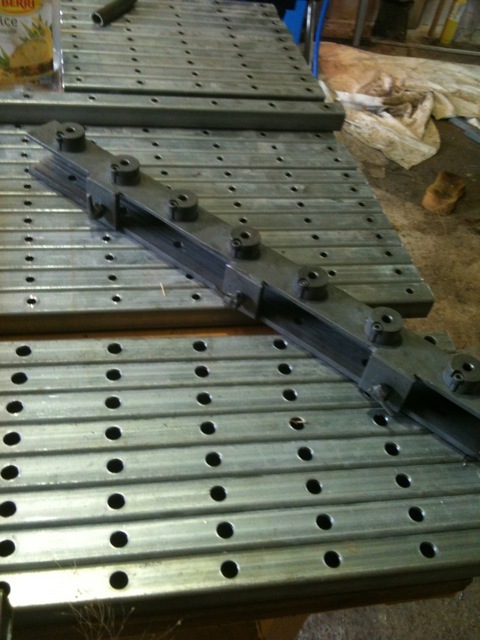 It’s one of the main design solution points of the Gundaroo Tiller design! hi there, are broadforks available yet? I have a 7 tined broadfork with a broken long tyne. I have succeeded in removing the broken stub and require a replacement tyne and countersunk allen head screw. Could you please send me one? For sure! I’ll call you to sort out the details~! My garden used to be full of beds and butts that had not been turned over for years. And full of slugs too! So I used less and less straw, and some beds finally get compacted… Buying a broadfork seemed exciting to me. I thought it would probably allow me to work faster than the fork and without turning the layers of the soil (which I knew is not recommended). A generous investment but looked like the thing would last forever! Currently, I’m using the broadfork on all my butts having tinkered its 7 teeth 15 cm apart and I’m happy. 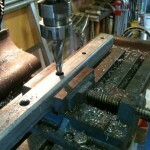 I was wrong at one point only – the darn thing is prone to breaking apart, so watch it! It is a very wise investment, indeed, if you are ready to do some modification. 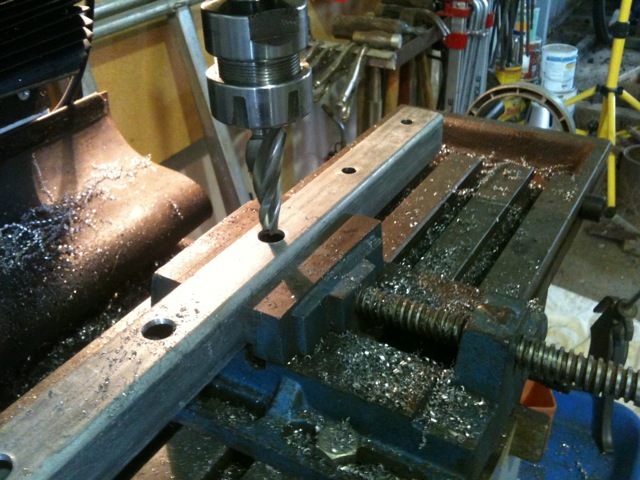 In my case making a 7-tooth tool was based on a why-not decision, but it’s proved useful even if heavy (because it was necessary to make the tine section full-steel so it would be able to withstand all the pressure).